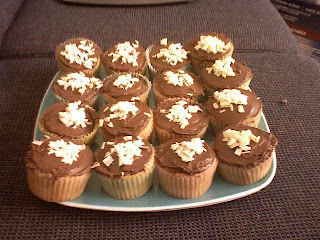 Here they are in all their glory, pound cake cupcakes with milk chocolate frosting and white chocolate shavings. These actually came out pretty well, although surprise, surprise they were all slightly different sizes. I try, but when they're raw, they always look about the same! Plus once you've put them in the little cases, its pretty hard to move the batter around...trust me, I've tried that before in my checkered past. It doesn't turn out well. Or clean. Anyway the frosting here is (gasp) store bought...Betty Crocker I think. I suppose its cheating but the store bought stuff is generally pretty good, so why bother with all the extra effort? Which brings me to the only part of this recipe that didn't go exactly as planned - the decoration. Originally I had wanted to decorate them with white chocolate curls, which are pretty and plump and three dimensional. But to my great dismay, I discovered (after, of course, googling chocolate curls) that making those involves melting the chocolate, pouring it out into a pan, letting it cool somewhat and then going at it with a spatula of some sort to create the curls. I don't quite have the patience for that. So instead, I wondered, hmmm what if I just take a vegetable peeler to a bar of white chocolate? Well I did and voila! Chocolate shavings. The lazy way to decorate. The cupcake recipe can be found here. Tip of the Day: When filling cupcake cases, use an ice cream scoop to get level results.